It would be no exaggeration to state that Madurai is a true representation of the cultural ethos of India, and of the grandeur of Indian art. Central to this standing is the sprawling Meenakshi Sundareswarar Temple. The plurality of faiths centered around the Meenakshi Sundareswarar temple, the splendour of its festival traditions, the invocation of events from the 1st millennium CE in its festival traditions (as in the enactment of the Tiruvilayadal Puranam), the association with the Golden age of Tamil literature - the Sangam period, the abundance of literature associated with the temple, the wealth of sculpture seen in the temple, the popularity of the temple in terms of the number of visitors etc. contribute to this standing. The literature of the pre Christian Sangam period speaks of Madurai. The devotional hymns of the Nayanmars venerate Somasundarar - or Aalavaayan of Madurai. 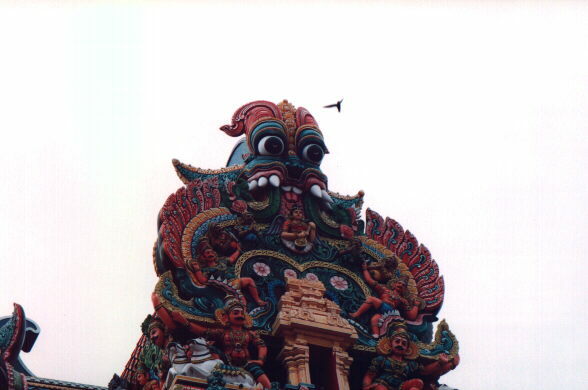 The Haalaasya Mahatmyam or the Tiruvilayadal Puranam speak of the various legends associated with Shiva, which still form a part of the festival traditions of this temple. The most amazing feature of this temple is the fact that it is a living legend, absorbing traditions for over two millennia. In its finished form, it represents the marvelous resilience of the Indian cultural ethos - (the fact that it was reconstructed during the Nayak period, after the destruction of the temple by Malik Kafur, one of the generals of Allaudin Khilji). 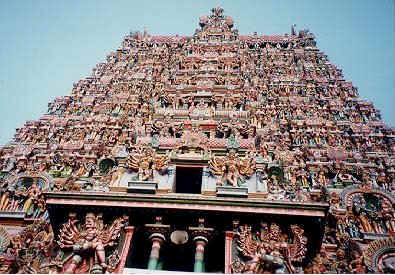 Legends such as Meenakshi Kalyanam, the coronation of Meenakshi and Sundareswarar as the Queen and King of Madurai, still form part of the grand festival traditions. In fact, Meenakshi and Sundareswarar are regarded as the Royal Pandya rulers of Madurai; Meenakshi's father, is said to be Malayadwaja Pandyan, who was preceded by Kulasekhara Pandyan - the legendary builder of the city of Madurai. The living legend the temple is - is complimented with architectural and sculptural splendour thanks to the vision and patronage of the Madurai Nayak rulers - successors to the Vijayanagar empire. Towering Rajagopurams dominate the skyline of Madurai; each of these gopurams is filled with myriad stucco images reflecting legends from the puranas; the temple complex in itself is a lavish art gallery, what with the grandeur of sculptures in the 1000 pillared hall, the millions of stucco images adorning the towring gopurams of the temple the murals, the depiction of the Tiruvilayadal puranam - only to name a few. The festival traditions here represent a congruence of the Saiva, Shakta, Skanda and Vaishnava streams of the Hindu religion - thanks to the adept repositioning of the Maasi Tiruvizha in the month of Chittirai, to coincide with the annual festival at the Kallazhagar temple, when all of Madurai is transformed into one huge space of celebration.